If I thought the first Third Thursday with the cooking queens was exceptional, I was in for a real treat this time. First of all, I was a little late. STUPID ME. I was greated by a lovely site of women forming little balls of this creamy, cakey looking substance and placing them on cookie sheets. 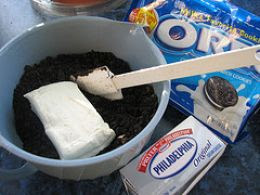 I took a look around the kitchen and one was crushing a ton of oreos like there was no tomorrow. Geez, I love the smell of chocolate in the morning! Oops, it was the evening. Then, I got a lovely chocolate martini. It was magnificient. Full of white chocolate liqueur, creme de cocoa and vodka. It was unbelievable. I figured I should investigate the pots of white chocolate and milk chocolate on the stove. One smell..........oh yum............. The site of creamy, smooth and fragrant white chocolate is enough to put me within 2 inches of pure nirvana. It turns out that these lovely oreo balls and cherry chip cake balls were mixed with cream cheese and cherry icing and then dipped into the chocolate. Set aside on a tray, let the chocolate harden and then pop these little babies in your mouth. Let me tell you. If you eat one you eat 10. My favorites were the little oreo ones dipped in white chocolate. It was a fun time with wonderful women. We discussed movies (tear jerkers that make us cry and cry.......like My life with Michael Keaton) current events, coffee machines, Winnie the Pooh, Facebook and had a great time. We're all very different but blend together like that perfect cup of coffee with just enough cream and sugar. This Third Thursday is a great concept! I don't know the calorie count. I don't want to know the calorie count.